Give a USTA membership to the tennis fan on your holiday shopping list. You’ll feel great knowing you’ve given someone the opportunity to get more connected to the game than ever before. The valuable benefits include – access to USTA League and Tournament play, exclusive discounts on USTA and US Open merchandise, sports gear and travel, a one-year subscription to TENNIS* and USTA Magazine and so much more. Plus, with a 5 year membership, we’ll include a free US Open Cinch Bag**. Avoid the shopping rush, Click here to order and use source code 3456. *For members subscribing to an Adult, Family or Life Membership, $10 of all membership dues is allocated for a 1-year subscription to TENNIS magazine. For members subscribing to a Junior Membership, $10 of all membership dues is allocated annually for a 1-year subscription to SMASH magazine. The amount allocated is not deductible from membership dues. All resorts, camps and benefits are subject to change at any time. Not combinable with other offers. Not all programs may be available in every area. USTA membership is not transferable. 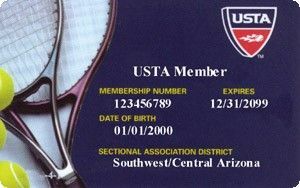 By joining, I agree to adhere to the Constitution, Bylaws and USTA Regulations (available at USTA.com). ** While supplies last. The USTA reserves the right to substitute. To ensure delivery by 12/21/07, order must be placed by 12/9/07. Offer valid until 12/31/07. © 2007 USTA. All rights reserved.